Slip in a size 22-24, bust 44" and 40" shoulder to hem. machine wash. Funnily no one ever complains about that! small parcel upto 2kg £3.25. BNWOT: item appears unworn, no sign of use, still has that 'new unwashed' feel. 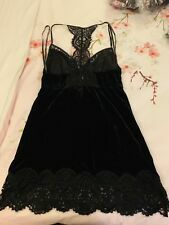 M&S Rosie for Autograph Black Jersey Chemise. The bust is padded and has lace detailing. Ladies UK 12. Machine washable.